A former private eye working in a petrol station receives a message from a gambler demanding a meeting. As he heads to the encounter, he relates the tale of how he was once hired to find the gambler's runaway girlfriend, and how that case had left the client holding a deadly grudge. 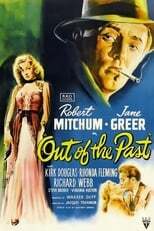 Film noir, starring Robert Mitchum, Jane Greer, Kirk Douglas and Rhonda Fleming.